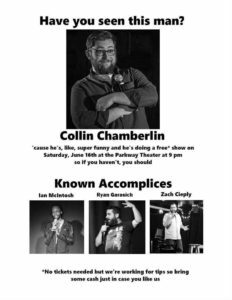 Collin Chamberlin is a Pittsburgh native comedian. He started doing standup comedy in June of 2013. Some extremely generous people have described him as, “unique,” “relatable,” and “handsome,” but we’ll leave the judgement to you. He has been fortunate to make fun of his parents and ponder his obsession with Happy Meals at clubs, college campuses, and private events, including the Arcade Comedy Theater, the Pittsburgh Improv, and The University of Pittsburgh. He has worked with great local talent, as well as national acts such as, Christina Pazsitzky, Greg Warren, Dave Coulier, and SNL’s Kenan Thompson.